The latest issue of New Equipment Digest features an interview with John Kuhnz, Dorner’s Director of Marketing, on our new Cantilever Stand Mounts for the 2200 Series and 3200 Series, conveyors. Why did Dorner decide to develop this particular product? Customers have requested ways to reduce the time and difficulty to change belts. Since our conveyors are often in and or around equipment. This makes them difficult to get to. So, when the belt wears down, the time invested to change it can be significant especially separating the conveyor from the stand to change the belt. What makes Cantilever Stand Mounts different from like products on the market? This product is unique in the fact that the conveyor does not have to be separated from the stand. The separating of the stand from the conveyor is often the most time consuming but also the most physical. On long conveyors this requires two people since the conveyor can only be separated from on stand at a time. Did any problems need to be addressed during the development process? The problem encountered during design was how wide could the cantilevered stand be applied. Dorner has some conveyors 36″ wide. The design team needed a way to make this cantilevered stand work at this very wide width. The goal was to improve speed and ease of belt change. 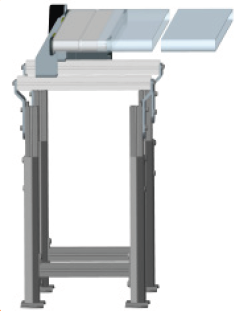 The team developed to varieties of cantilever stand that accomplished both goals for both narrow and wide width conveyors. How long did it take from conception to ultimate production? It took a little over 4 months once Dorner started the project. A fair amount of that time was engaging customers that requested help in the belt change area. What role did cost factors play in changing the final design of the product? As with all projects costs are evaluated against the benefit or value to the customer. With this particular project the cost was relatively minor compared to the benefit to the customer over the life of the conveyor. Who is your target market and what benefits will they realize from using this product? The audience Dorner is trying to reach with this solution is frequent belt change customers. Or more simply stated customers that go through the pain of time, cost, and difficulty of change over with belts. This solution gets them running quicker, easier and most importantly with less cost. Any additional information you might want to add? As in all projects Dorner was not certain of the adoption rate among potential users. Almost right out of the gate sales was hit with an instant wave of adoption. Dorner has even had more customers retrofitting conveyors than originally planned. In summary, it is great to develop a solution a simple as a cantilever stand mount and have results show you solved your customer?s pain. Reference: This entire interview was originally posted online at Cantilever Stand Mounts Current Issue New Equipment Digest.